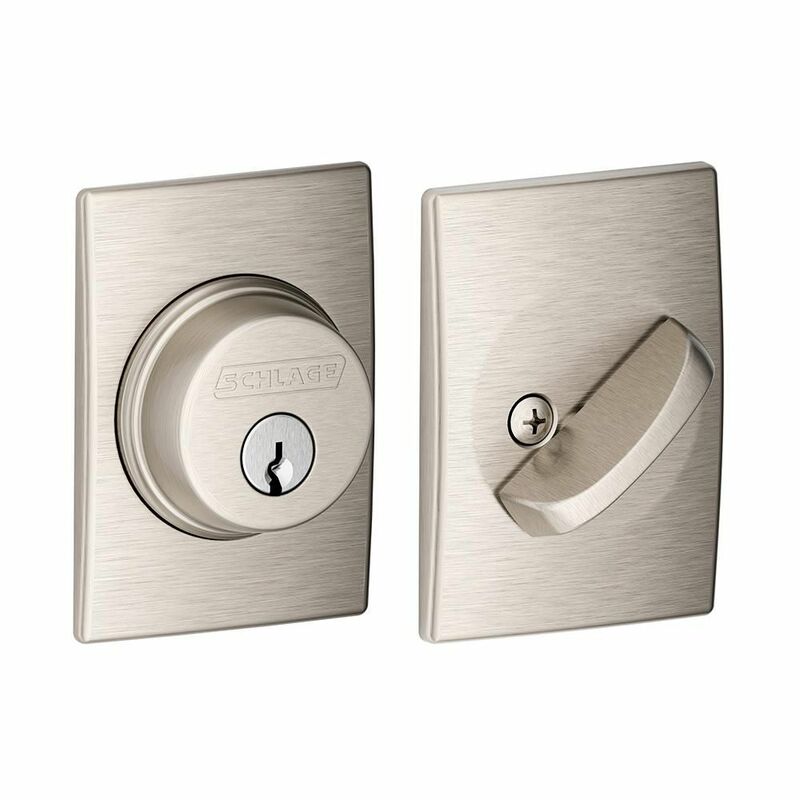 The Schlage Single Cylinder Deadbolt with Century Trim in Satin Nickel is perfect for use on exterior doors and adds an extra layer of security to your exterior handleset or knob/lever. The Century Trim is chic with a delicate, slightly curved shape. When finished in Satin Nickel, the deadbolt offers a tasteful and flattering accent to any home. Plus, it's been designed and tested with strength and durability in mind. This single cylinder jimmy-resistant deadlock is constructed from die cast and comes plated in satin nickel. It locks your door to the jamb to prevent forced entry. It features a tamper proof shutter guard and requires a 1-1/4 in. hole for installation. Your front door is the place where security and style meet. That's why the front entry handle set you choose matters so much. To ensure your home's security, all Schlage front entry handle sets are precision-engineered and easy to install. And to compliment your home's style, Schlage offers a wide variety of different designs and finishes, from simple and classic to sleek and contemporary. The Camino handleset makes a bold statement with its faceted, geometric shape. This handleset includes a low-profile deadbolt and SmartKey Technology, which allows the homeowner to re-key their lock in seconds. Camino also features an adjustable screw that allows for easy door mounting and a guaranteed fit. The crisp, clean appearance of the Satin Nickel finish adds to the overall look of the product and brings a modern feel. Single Cylinder Deadbolt Century Satin Nickel The Schlage Single Cylinder Deadbolt with Century Trim in Satin Nickel is perfect for use on exterior doors and adds an extra layer of security to your exterior handleset or knob/lever. The Century Trim is chic with a delicate, slightly curved shape. When finished in Satin Nickel, the deadbolt offers a tasteful and flattering accent to any home. Plus, it's been designed and tested with strength and durability in mind. Single Cylinder Deadbolt Century Satin Nickel is rated 4.8 out of 5 by 14. Rated 5 out of 5 by HomeDepotCustomer from Great product and easy to install. ... Great product and easy to install. Rated 5 out of 5 by Susan from Pretty. Goes with the other Century hardware. Works well.... Pretty. Goes with the other Century hardware. Works well. Rated 5 out of 5 by ahorizonman from Very nice Schlage quality at a fair price. Works well the coordinated entry lever lock. The no ... Very nice Schlage quality at a fair price. Works well the coordinated entry lever lock. The no cost rekeying to match other exterior locks a nice bonus from Home Home Depot. Rated 4 out of 5 by TF from Nice product. ... Nice product. Rated 5 out of 5 by Richard from Replacement deadbold for which the installation went very smoothly. ... Replacement deadbold for which the installation went very smoothly. No problems. Rated 4 out of 5 by ncbieber from Works like a deadbolt is supposed to Pros: Easy install, looks, matches century latitude style. Cons: Circular lock mechanism is not attached to century rectangle back plate and can spin freely even when tightened. Just to note, the back plate is quite a bit smaller than the back plate for the handles. Took a while to align when installing. Rated 5 out of 5 by Chris from I ordered to cover some door imperfections that a circular... I ordered to cover some door imperfections that a circular deadbolt couldn’t cover and this worked perfectly. Easy to install.